The Brome Squirrel Buster Standard is part of a full line of squirrel deterrent products offered by Brome. If you haven’t heard of Brome, that may be because they are a relatively narrow in their focus of providing squirrel deterrent bird feeders and matching accessories. They have about a dozen products that all center around one common goal: stop squirrels from visiting your bird feeder. Brome is headquartered in Quebec, Canada and led by its founder Paul Cote who is largely responsible for the long list of patented features available on many of their products. Brome also has a great reputation for customer service and is beloved by many bird enthusiasts. The quality of the Brome Squirrel Buster Standard is marketed heavily by the manufacturer. On the Brome Squirrel Buster Standard, the outer sheath and seed tray are all made from a proprietary material called “RoxResin.” This material is patented by Brome and is chew proof, waterproof, rust-proof, and even UV stabilized. The color is actually mixed in the resin so the feeder should show very little fading and deterioration over time. The perch bars are made from stainless steel. The mechanical parts within the feeder that trigger the squirrel deterrent are also metal. The tube which holds the seed is made of plastic yet is not exposed to any elements or chewing. Overall the quality of the Brome Squirrel Buster Standard is well above average and even comes with a lifetime warranty to prove it. The Brome Squirrel Buster Standard has a great list of features and is well-engineered. 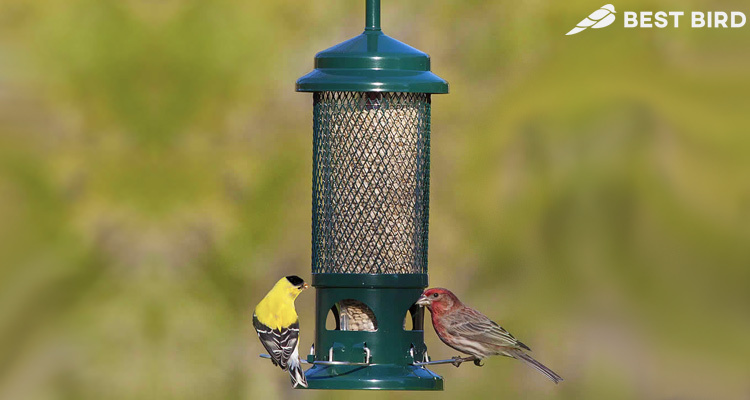 Patented Squirrel Buster – The perch areas are weight sensitive and when anything heavier than your favorite bird uses it, the feed tray is blocked by a metal sheath blocking the feeding port. Nearly all the components that require cleaning are dishwasher safe. All of the exterior parts are made from “RoxResin” making them chew proof. The exterior is UV stabilized to resist degrading over time. The standard version of this feeder is on the smaller side measuring just 12 inches tall (without the hanger, shaft, and hook which add another 10 inches to the top). With a 3/4 quart seed capacity, you can expect to refill this feeder every few weeks. Luckily refilling is easy with the cleverly designed feeder that comes apart easily. Cleaning the Brome Squirrel Buster Standard is one of the easiest available as the parts which require regular cleaning are dishwasher safe. You can dismantle and have your birdfeeder cleaned in a matter of seconds (aside from the time for the dishwasher to run). There have been a few issues reported about seed getting stuck inside this feeder and that the feeder has been knocked off its hanger by squirrels. These issues are not widely shared as most owners of this bird feeder find it to be relatively easy to maintain. The Brome Squirrel Buster Standard presents a little more of a challenge than just hanging from a hook. But, that is part of its charm as you let the over-engineered features connect together. Once you get the feel for how all the parts serve a distinct purpose it will install quickly. Learning the components will be helpful as it partially must come apart to refill. This feeder is best hanging from a tree limb, hook, or shepherd’s pole. For it to work best, it is advised that the feeder is 18 inches away from any jumping off point. At a retail price of $37.95, this feeder sits at the higher end of the spectrum given its size. But, the feature set and quality of the Brome Squirrel Buster Standard is in a class of its own. With a lifetime warranty and all the benefits that allow Brome to make that guarantee, we believe this is money well spent. Many owners of this feeder rave that it still looks new after years of use and this is something you must not take lightly. Buying 4 bird feeders over 4 years at a discount price or 1 Brome Squirrel Buster Standard every 5. In the end, we believe the value is in the Brome purchase. With working squirrel proof features, stellar customer service, rust and chew resistant components, and dishwasher safe maintenance it is hard not to love the Brome Squirrel Buster Standard. If you have the budget to spent a few dollars more on your small-to-midsize bird feeder and have a place to hang it, we think this is a wonderful choice that you will enjoy for multiple years, not seasons.